The big unexamed question concerning Himmler was his alleged suicide. I find it very strange that the one Nazi who had so much to tell the world about who had financed Hitler and the Nazis, Hitler’s bagman and political financier Himmler, would have killed himself. He alone had the knowledge to inform the world who had really ruled us then (just as now). He could have told us how our masters create ( and continue to create) all the wars, assassinations, and revolutions. I am very suspicious that Himmler was silenced just as Robespierre had been silenced by being shot in the jaw ( so he could not talk) and then guillotined during the French Revolution the day before he was to give his speech in which he had intended to “tell all” , to tell the world who was really behind the French Revolution. It seems to me Himmler , as the bagman, was the one German who knew far too much. It believe it highly likely that he did not kill himself. More than likely, I believe, British killed him upon capture. They had to. You might recall that Hess probably knew far too much also , so he was imprisoned for 50 years , over five times as long as Speer, for example, only to die very mysteriously weeks before his release from prison. Jack Ruby and Lee Harvey Oswald , who also knew too much, were handled the same way. I rest my case. I know you've been into this line of thought for many years, and still think you're barking up the wrong tree on this bit. I've tried to lend it objective evaluation from whatever little sources there is about it (most seem to originate from America) and I have failed to see any credible proof for these claims. No doubt Himmler was murdered, that I can believe, but by far different reasons than for allegedly having been in cahoots with "International Finanzjuden". Even in the early days the proponents of this theory makes claims that Hitler and NSDAP was financed by the so-called "Big Industry", but that is not true according to German professor Rainer Schmidt . 1. Prof. Schmidt is an historian from the University of Würzburg. I have e-mailed Prof. Schmidt to get the original study written by him on the subject. Haldan....Thanks for your reply. Are you questioning the American and British financing of the Nazis, or Himmler's association with these banks through his Circle of Friends, or both? Seems to me Barrington that we have similar visions of the world. It should be no secret to anyone at the moment, that the greatest supporters and profiteers of Wars are the Financial/Industrial/Military complex, and that this same complex has been pulling the strings of major events since at least the 17th/18th century. One just has to look at who gives the biggest donations for political campaigns of both sides of the political spectrum to understand who really pulls the strings. About Himmler himself... more than being the financial man, he was also the head of everything related to "Occult" (seems to me a subject not much discussed here in CODOH, but one that at least on my opinion, is a vital one in order to understand not only the Nazi philosophy, but also a big deal of what have happened/is happening in the World). Himmler knew a lot about many things that are of the least desire of the "Ruling Elite" to be brought up, that goes way beyond the financial side of it, so i wouldn't be surprised he had been killed as so many before and after him, in order to keep him of talk. What I see as 'financing Hitler' is IMO nothing more than making business investments in Germany. Hitler and the NS brought Germany from the ashes and Germany was / is a titan of industry, granted the EU is now a basket case. Why wouldn't anyone want to invest in a country whose economic output was enormous, hence the return on investment was profitable. That's simply normal business practice. Naturally those involved in industry respected this and wanted in. As for Himmler and the falsely claimed suicide, Joseph Bellinger's book on Himmler contain images of Himmler, dead, in a beaten condition. Himmler was murdered by his captives. There can be no serious, knowledgeable debate on that. There was no way they were going to let the one man who could utterly bring down the claims of the absurd 'gas chambers and 6M' testify. Himmler was a very smart man who would have demolished the prosecution at Nuremberg. Another big question, why did Himmler's diary curiously disappeared? I think we know why. Himmler was also "the Architect of the camps". Can you imagine the jewish liars come in Nuremberg and talk about their ridiculous steam chambers and idiotic gas chambers with Himmler in the court room? No Warburgs. No Rothschilds. No Rockefellers. While the Rockefellers indirectly came into Hitler’s financial sphere by way of Standard Oil technical investments and the Warburgs via I. G. Farben and J. H. Stein later on, neither gave Hitler any financial support before 1933. And neither directly supported or paid Hitler at any point in time. The Sidney Warburg story is pure fabrication. Fritz Thyssen and some of Hugenberg’s heavy industrial connections, not James Warburg, gave Hitler substantial monetary gifts in 1929 (at least RM 1,250,000) and Deterding and several German coal companies took care of Hitler in the early 1930s. While Hitler spent a vast amount on campaigning, he was by no means rolling in untraceable money. All of his funding was carefully accounted for and most of it came from VB advertising; party dues, insurance, and speaking fees; Gregor Strasser’s left-wing faction, which received RM 10,000 per month in 1931; the good will of VB publisher Adolf Müller; and the financial frugality of party treasurer Franz Schwarz, whose meticulous party financial records were destroyed. The Americans interrogated him so brutally that he died in 1946 in British captivity. His records denoting even Hitler’s anonymous donors never turned up anywhere. The Pools suspect that the American occupiers destroyed them. The NSDAP was not put into power by international Jewish interests as some researchers suggest. The NSDAP fought for its power. For example, in just a single street battle between the National Socialists and Communists, 300 men were killed. Hitler struggled for 14 years to achieve power and was nearly shot dead during his attempted putsch, facts which challenge this thesis. The I. G. Farben conglomerate and high finance never factored into the Hitler-NSDAP equation before 1933. Big business’s main motive for supporting Hitler and the NSDAP was to prevent Communism at all costs. Thyssen admitted to funding the NSDAP. His continuous support and Hitler’s strategic alliance with Hugenberg and the Nationalist Party meant money for Hitler in 1929—none of which was from Sidney Warburg. The United States likely destroyed Party Treasurer Franz Schwarz’s records, which were meticulous: Hitler had even told him to denote names of anonymous donors! All of the records are gone. 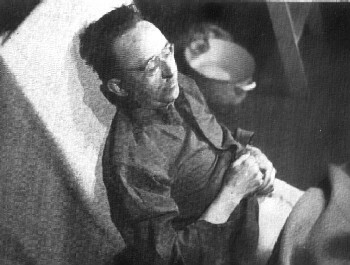 Americans brutally interrogated Schwarz and likely murdered him in 1946. The Anglo-Americans were determined to incriminate only German big business for funding the NSDAP at the IMT. Given that the United States did this, one suspects that there was more American-based funding than just Henry Ford and Teutonia behind the NSDAP, but what that was we will never know. The Anglos were likely trying to cover up American industrial involvement with NS-Germany after 1933, such as that of Standard Oil which we’ve already discussed. Hitler received Italian fascist funding, which only came to light in 1932. Mussolini also sent the NSDAP weapons in the 1920s. As one can see his alleged 1931 “miracle financing” was no miracle at all. It came from German coal companies, not Sidney Warburg. In fact, most of the NSDAP’s money came from the party itself: insurance premiums, dues, speaking fees, etc. Brüning, not Hitler, was backed by I. G. Farben. Chancellor Schleicher, with Silverberg’s and other industrial bigwigs’ money, conspired with Ernst Röhm on a plan to incorporate the SA into the German Army and thereby betray Hitler. „Millionen stehen hinter mir. Der wahre Sinn des Hitler-Grußes.“ Zur Finanzierung der NSDAP vor 1933., in: Historische Mitteilungen der Ranke Gesellschaft 16 (2003), S. 140-154. So this reply with additional details from Prof. Schmidt coincides with the footnote in a text called “Did German Big Industry Finance Hitler?”, validating it to be fully accurate. Hello Haldan, Schmidt, ....Thanks for your input. I will certainly have to do some re -reading of my sources, in particular Antony Sutton, “ Wall Street and the Rise of Hitler”. However this reading will take some time and since I am off to Europe for a month in a few hours , my full reply will have to wait. I suggest, however, in the meantime , that you read Sutton’ s book. Here is a very brief summary of Sutton. In Chapter one he claims that the Dawes Plan and the later the Young Plan were both engineered by the International Bankers led by JP Morgan people ( Who, I may add, would be Rothschild hitman) with the authority and seal of the US government to float huge profitable loans to the German cartels for American profit. Essentially the Plans were to occupy Germany with a gigantic mortgage held in the USA. However, Sutton claims that according to Hitler’s American banker Hjalmar Horace Greely Schacht, it was the 1928 Young Plan , formulated by Own D, Young , the then President of General Electric, that brought Hitler to power in 1933. Was this Hitler event intentional or an accident ? …..Sutton does not say. Carroll Quigley, however, states in his book “Tragedy and Hope” that this system of finance, which included the creation of the BIS, the Bank for International Settlements, was ..” nothing less than to create a system financial control of the world as a whole”. In other words, Hitler was part of a larger plan. And this does seem to be the case today. Goldman Sachs rules. Sutton also states, for example, that the three largest German Cartels were German General Electric ( AIG), Vereinigte Steelworker ( United Steelworks) , and I.G. Farben; and that the Wall Street floating syndicates and their loans , in brackets, were National City ($65,000,000), Dillon Read ($ 70, 000,000). Handling almost 100% of the above mentioned German reparation settlements and financing were three Wall Street Banks and their loans to Germany were: Dillon, Read & Co. ( $241, 325, 000), Harris Forbes & Co. ( $186,500, 000), National City Co.
( $173,000,000), Speyer &Co. ( $59, 500,000), Lee Higgins and Co. $(53, 000,000) , Guaranty Co, of NY ( $41, 575, 000) , Kuhn, Loeb $ Co, ( $37, 500,000) and Equitable Trust Co. ( $34, 000, 000) for a total of $ 826, 300, 000. …so in actual fact Germany never paid its reparations. Suttons sums up this Chapter by claiming that General Motors, DuPont, Ford, and a “handful “ of other U.S. Companies …“controlled by the Wall Street elite led by J. P. Morgan Co. , Rockefeller Chase Manhattan Bank, and to a lesser extent , the Warburg Manhattan Bank …“ ….“all controlled by the Federal Reserve System” …“were intimately involved with the development of Nazi Germany”. In Chapter 2 he states that the Directors of I.G.F. America were Walter Teagle, the President of Standard Oil, a close friend the President of Roosevelt, and Paul Warburg who contributed 4000, O00 RM directly to Rudolf Hess and the Nazi Party for the 1933 elections. In Chapter 3, Sutton concluded that Siemann Electric did not support Hitler but A.E.G. and Osram both did. its technical aid to Nazi Germany in synthetic, rubber and gasoline…with the clear knowledge ( of S.O. ) that without these two products WW2 would not have been possible. Sutton never states why and who wanted the war. And so on. You will also be interested to read his take on Sydney Warburg….so different and interesting….And perhaps you might wonder why he mentions Henry Ford and his backing of Hitler so much but fails to mention that Ford was created by J.D. Rockefeller…..and he also mentions that although many of the German directors of the cartels, banks and industries were arrested after the war and put on trial , none of the Americans ever were….except for Schacht….who spent a few months in jail…. The rest of them all got off. Finally, in view of all the above, or in spite of the above, I must mention that Eustace Mullins claims that Sutton was a brilliant researcher but that he, Mullins, claims that the ugly truth about Sutton is that the Rothschilds paid Sutton to re-write history …perhaps that is why Sutton mentions everybody involved in the financing of Hitler and the Nazis …and although many of them like Rockefeller, Warburg, Schoder ,the Federal reserve and The Bank of England are closely associated with the Rothschilds.... Sutton never once mentions the Rothschilds. So have fun reading the book. It is an interesting read. One of the best. Happy holiday. Barrington James wrote: You might recall that Hess probably knew far too much also , so he was imprisoned for 50 years , over five times as long as Speer, for example, only to die very mysteriously weeks before his release from prison. I wasn’t aware plans had been made to release Herr Hess from prison. I would appreciate it if you would make your source for this information known to us when you return from your holiday. Rabbi Shlomo Risikin: "The [non-Jewish] world is divided into parts: those who actively participated with the Nazis and those who passively collaborated with them." MORE good writing done on Himmler all day. It is a gigantic project. It is now beginning to resemble one of those half finished skyscraper buildings along the Mediterranean coast of Spain -- the ground floors all completed and already occupied, the middle storeys still needing windows put in, the upper floors still a mess of girders and scaffolding and pallets, with tower cranes abandoned and swinging in the winds. The "top floor" has however been in place for three years already now: the mystery of how he really died. I have been working on "Churchill's War", vol. iii: "The Sundered Dream" over the past years, it is already complete but needs to be polished; it will not appear until about 2015. I have to finish my Himmler biography first, which is taking far longer than I anticipated. Hello Charles Traynor.... Thanks for your request. Please see my thread " Who killed Hess and why" for my short but best answer to date. Hey all, the topic is "Who Killed Himmler". 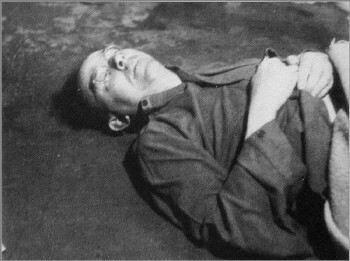 Himmler after being murdered; note broken nose & abrasions. Interview with author, Joseph Bellinger. Full text below, see above link for various links within the text. - Hello, Mr. Bellinger, may we commence with the most typical question possible: could you please introduce yourself swiftly to our BBET-readership? Certainly. I am an American freelance writer, investigative reporter and independent researcher. I am a relative newcomer to historical revisionism. I have written as a free lance journalist for various independent newspapers and book publishers here in the States, followed by on-line publication of historical revisionist material. Much of my earlier work in this field was written under various pseudonyms. I do, however, have one unpublished manuscript relating to theology and another unfinished manuscript dealing with Nueremberg. ’ at Arndt Publishing, which quickly became controversial. As we have seen it is the result of a long search. How were you driven to this rather peculiar subject? Will it remain a legal book in Germany? The Himmler book was based almost entirely upon a set of coincidental circumstances, in that, while browsing through photographs of the Reichsfuehrer’s corpse some ten years ago, I noticed irregularities which appeared to be inconsistent with the published accounts of his death. I then compared these photos with those of Hermann Goering and also with other victims of cyanide poisoning which I examined in various forensic textbooks and the differences seemed rather startling. At that time I did not regard this preliminary inquiry to be conclusive evidence by any means, but I suspected that I might be on to something and decided to take the research to the next level. At this point I still had no definite plans to write a book on the subject, but decided to go on a ‘fishing expedition’ and see what might come out of it. 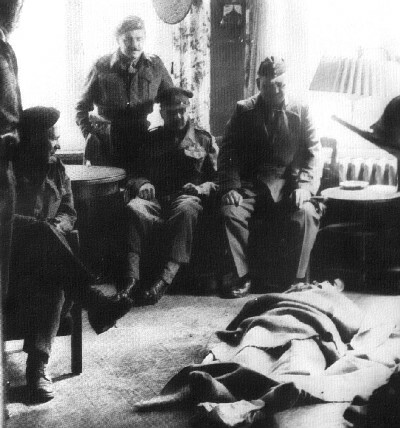 The research was still in the most elementary stages, but over time the convergence of evidence finally paid off and convinced me that Himmler’s death, along with other high-ranking officials in the Third Reich, was the result of a deliberate decision to assassinate him within hours of capture and identification, and that the trail of responsibility led directly back to the SOE [Special Operations Executive], the PWE [Political Warfare Executive], and 10 Downing Street. By 1996 I had assembled a dossier full of information all relating to Himmler’s alleged ‘suicide’ and had established written contact with sources in Germany and England who provided me with further information. On or about the same time, I wrote to David Irving and set my thesis out for his consideration, and he replied in a positive vein, and there the matter remained until one day I received an invitation from David Irving to speak on the subject of Himmler’s death at the first “Real History Conference” in Cincinnati, Ohio, which led to the signing of an interim, provisionary agreement to author a book detailing the true circumstances of Himmler’s death. The timing couldn’t have been more fortuitous, because by the time I set out to write a complete manuscript, new files pertaining to Himmler’s capture and death had just been released by the archives in England and the United States and I availed myself of this material in the creation of the manuscript. Thus, I completed the original manuscript within one year of being commissioned to write it, but as circumstances turned out, Mr. Irving did not fulfill his promise to edit or publish and the book entered into a stage of limbo, although I continued to update the material from time to time with newly released information. A subsequent publisher in America indicated some interest in publishing the book but those plans also fell through. Finally, I was contacted by the good people at Arndt Publishing in Germany, who indicated that they were interested in publishing my manuscript. Once again, the timing could not have been more perfect, because by then additional information of a most remarkable nature had been released or published revealing more details of the curious circumstances of Heinrich Himmler’s death, and all the most updated information up until July 2005 was appended to the manuscript. This information included details of interviews with participants or characters in the drama which had hitherto been unpublished. These witnesses were unavailable to other researchers simply due to the fact that they had since died. Finally, the book had to be translated into German, and this assignment was undertaken by the remarkably gifted Mr. Juergen Graf, whom I assisted as best I could whenever a question arose as to American or British idiomatic expressions. Assembling rare and unique photographs completed our work and the rest is history, as they say. As to whether the book will remain legal in Germany, I see no reason why it would not be. - The official version that the captured Reichsführer SS only spent 15 minutes in captivity before breaking a cyanide capsule has indeed large discrepancies. Could you name us just a few anomalies? Doesn’t this bring us too much near the fictional what-if scenario’s, given the little evidence after 60 years, or am I wrong? This is perhaps the most significant anomaly to speak of, if we exclude the rather preposterous claim that Himmler had concealed in his tooth or sulcus [the accounts and descriptions vary], a cyanide capsule which he bit into in an attempt to elude justice. Further anomalies abound throughout the story. Although all the allied accounts insist that not a hair on Himmler’s head was harmed during the course of his 15 minute ‘processing,’ the facts as I uncovered them reveal a much different and sinister story – that Himmler was in fact brutally mishandled before his death. Thus, the idea that there is somehow a paucity of facts which prove Himmler was murdered is untenable. 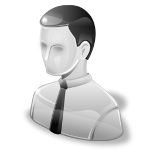 In fact, just the opposite is true – all the most updated information conclusively shows that Himmler was murdered, which deflates the entire proposition which would relegate the circumstances of his death to the ‘fictional what-if-scenario.’ The extra judicial killing of Heinrich Himmler was a crime, and as is the case with all crimes or unsolved mysteries, the discovery of new and relevant facts are enough to reopen a legitimate enquiry which may ultimately reveal the true chain of events which establish the fact of murder, along with the motive. In Himmler’s case we finally have both murder and motive clearly established. For example, I might cite Mark Furhman’s excellent book, “Murder in Greenwich” as a point in fact. Furhman’s fine investigative reporting led to the arrest and conviction of Michael Skakel in a murder case which had eluded the police for more than twenty-five years! This brings us to another subject of debate on post-WW2: the leering Jewish murder squads who roamed around Western Germany until 1948. Is there any proof that the Himmler murder fits in with these murderous goons? In this instance, no. Presently there is no proof of any Jewish involvement in Heinrich Himmler’s assassination. In fact, I owe a debt of gratitude to former Israeli President Chaim Herzog for his candid description of Himmler’s initial treatment at the hands of Colonel Michael Murphy. At the time, Herzog was a young Captain serving in British intelligence who participated in the liberation of Belsen Concentration Camp and was later transferred for duty at the holding camp at Westertimke. Mr. Herzog was present at the time Heinrich Himmler revealed his identity to the senior British officer at the camp. As it turns out, Herzog’s account of what transpired is accorded respectful treatment in my book. However, it needs to be pointed out that a number of men who accompanied Colonel Murphy in transporting Heinrich Himmler to Lueneberg have yet to be fully identified, and may have played a part in his mistreatment before his arrival at Uelzenerstrasse. - Furthermore: what if Himmler were indeed murdered in May 1945 instead of at Nuremberg one year later: what would have been the difference? What were the British motivations? Is this the reason why Himmler was discharged from service, to be replaced by Wolff? The difference here is that it was never intended that Himmler should be present in the dock at Nuremberg, if he should happen to fall into the hands of the British. Prime Minister Churchill was the most outspoken and passionate advocate of eliminating men like Himmler within hours of capture and identification. The rather ineffectual Ernst Kaltenbrunner was chosen as an ersatz substitute for the Reichsfuehrer-SS. Kaltenbrunner had recently undergone a ‘stroke’ after being mistreated by his British interrogators and cut a very poor figure on the witness stand. In fact, a number of Nuremberg defendants were already deemed disgraced or insignificant men by the allies. Thus, Hans Fritzsche was chosen as a substitute for Josef Goebbels, but Hermann Goering’s masterful, spirited and superb defense on the witness stand took the allies by complete surprise as they had seriously misjudged the man’s character, intelligence and determination. The psychological warfare experts apparently thought that by ridding the world of Himmler and men like Pruetzmann, they would be fulfilling a necessary service for their American allies, who repeatedly expressed grave alarm over the prospect of carrying on a protracted partisan war with the feared Werwolf Movement. The evidence and available documentation indicates that the PWE had determined upon a program of ‘re-educating’ / re-indoctrinating German society in combination with completely reorganizing Germany’s social and cultural milieu, and to most effectively achieve that end, deemed it expedient to create a ‘reverse stab-in-the-back’ legend which would lay the blame for Germany’s defeat solely on ‘cowardly’ men like Himmler and Pruetzmann, who would be saddled by allied propagandists with ‘leaving their men in the lurch’ to answer for all their alleged crimes. This strategy was in striking contrast to the claims circulated in post-World War I Germany that Jews were responsible for ‘stabbing Germany in the back’ and subsequently establishing a ‘traitor republic’ dominated by leftists and Marxists of various persuasions. In response to your question concerning General Wolff, there seems to be a bit of confusion here. Himmler was relieved of all his offices by Adolf Hitler based upon misleading information he had received in regard to Himmler’s alleged ‘peace negotiations’ with the British. In fact, Himmler was cleverly manipulated and used as a pawn in the masterful British plan to drive a wedge between the SS and the German Army. This was part of Sefton Delmer’s game, and he was a brilliant propagandist. One must give credit where credit is due. In Martin Allen’s book, which has recently attracted so much attention, the claim is made that Himmler was killed because his negotiations with the British was an embarrassment to them, and that they sought to prevent their American allies from learning of their behind the scenes machinations. With all due respect to Mr Allen, the theory is unconvincing and not in accord with the true facts, for the Americans themselves had been negotiating with Himmler’s emissaries for years through Allen Dulles in Switzerland and Italy. Himmler, in fact, had opposed General Wolff’s peace overtures to the allies and ordered him to report to Hitler in person. Himmler was astonished to learn from Wolff that Hitler had given his unofficial blessing to his initiatives as long as it would somehow benefit German interests. Himmler was replaced as RF-SS by Karl Hanke, who was later killed by the Czechs in July 1945. However apart from the controversial matter whether Himmler was murdered or not, we see an analogous book by Martin Allen shred to pieces, because some archive dossiers were alleged fakes. Is this plausible? How does this coincide with your work? I have already addressed Mr. Allen’s thesis to a certain extent above, but the forgery business deserves special comment. Although critics are careful in how they say it, the implication being made to date is that Mr. Allen is suspected of forgery in the matter of the newly surfaced documents which definitely prove that Himmler was murdered by order of the highest authorities in the British government in 1945. Although Mr. Allen’s thesis as to the motive behind Himmler’s murder is untenable in my opinion, we certainly agree on the fact that a homicide was committed. To date, Mr. Allen has yet to withdraw his book from the market, opting to wait and see when or if the authorities at Kew will ever get around to naming or charging the culprit they suspect of planting spurious documents relating to Himmler’s death at the Public Records Office. Personally speaking, I think this is a wise decision on the part of Mr. Allen, simply because there is no intelligent reason as to ‘why’ the culprit should not be positively identified and charged. The officials at the PRO are professionals and keep meticulous records as to who visits the archives as well as which documents are requested for perusal. If it should turn out that no culprit is publicly identified and charged, this would be sufficient cause for further investigation and perhaps a complete reassessment as to the authenticity of the documents in question. However, I did not initially rely on these particular documents to prove my case, seeing that they were just released recently, but I did have time to include them in the manuscript at the very last moment, along with a proviso attached, until this matter is conclusively settled once and for all. ‘Small H’ as the Allied conquerors called him, once a mighty man, then subject to investigation and torture, no longer a mighty intellectual, but a skinny body, the brain removed and his genitalia mordicus exposed. Do you have any sympathy or empathy for the subject of your book, or even his fate? In spite of his extensive and widely feared power and authority, Heinrich Himmler’s life and death assumes tragic dimensions for multiple reasons too complex to address in this interview. The unjust persecution of Himmler’s family by the allies after the war struck me as particularly cruel and malevolent, and this is a subject to which I devote considerable space at the conclusion of my book. Himmler’s death was a poorly concealed crime waiting to be solved - an act of assassination which clamored for exposure from beyond the grave. If I had not broken the taboo of silence, someone else would have; it was only a matter of time. In presenting a human face to all the participants in this drama, I have sought to humanize them instead of treating the characters as one dimensional figures cut in stone, much like the gargoyles of Victor Hugo’s “Hunchback of Notre Dame.” In essence, “Himmler’s Tod” is in essence as much a human-interest story as it is a crime drama and responsible historical reporting. - Are you active in any of the revisionist outlets, since we previously saw your name smeared by Nizkor? How do you view the future of revisionism evolving with the mass repression of state and synagogue? Those who deem it necessary to resort to smear betray a fundamental weakness and defect in one’s character, an insecurity and lack of confidence in one’s ability to intelligently defend one’s own position. Smear is the weak man’s palliative. It is a puerile form of emotional catharsis but an extremely poor substitute for rational, reasonable dialogue and debate. Historical revisionism, on the other hand, is a legitimate field of scholarly inquiry and should not be limited to select groups or individuals who happen to support a particular interpretation or point of view. The door to open inquiry and discussion should always be an option, and no human being should be made to fear for his or her future simply because their conclusions might happen to differ from the mainstream. 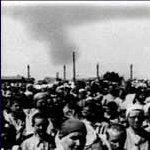 Today the ‘uniqueness of the Holocaust’ appears to have digressed from its role as an historical event to the point where its only ‘unique’ attribute consists in the fact that it is the ‘only’ field of historical inquiry, which has rudely slammed the door shut on anything other than repetitive mainstream asseverations. Thus, in many respects, the Holocaust appears to have now transcended the area of purely human inquiry and entered into the realm of the theological or arcane in nature, in which only the ‘initiated’ are accorded the ‘privilege’ of expressing their opinion. It is the only historical event, which has required special punitive laws to punish and prosecute those who, like Savonarola, should dare to express an opinion contrary to the accepted regimen. It is the only field of historical enquiry which can wreck lives, ruin careers, and tear families apart. Thus, there is something intrinsically antidemocratic and vindictive in the present ‘uniqueness’ which the Holocaust has unfortunately come to represent, academically speaking. - What are your future projects? In the near future I suspect I shall be somewhat occupied promoting the Himmler book and hopefully arranging for editions to be published in other countries and languages, but insofar as the distant future is concerned, I do indeed hold on reserve a number of projects for which I am hoping to interest a suitable publisher. - Any closing remarks to our audience? Simply to wish your readers the very best, and encourage them to hold dear their individual freedoms and to insist upon, uphold and defend our basic human right to responsible freedom of expression without fear of persecution. Thanks for the occasion of interviewing you! We wish you all the best with this book! Reader can order the book via this link or contact the writer. Is it actually certain that the cyanide capsules even existed?